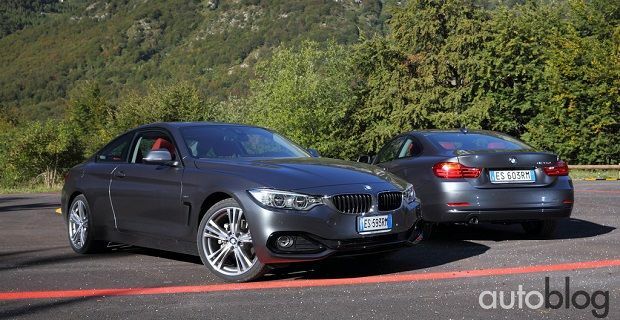 In the past BMW used to charge less money for the two door version of their 3-Series, and the forerunner to the 3-Series, the 2002, was only available with two doors but nowadays the two-door coupe is such a premium product that BMW has created a new model line. The premium BMW is charging equates to £3,000 more than the equivalent 3-Series saloon and for that you get a coupe that’s based largely on the saloon. The bodyshell is the same steel and aluminium construction found in the 3-Series but the body panels are unique to the 4-Series. The 4-Series has been lowered and fitted with fixed calliper brakes. The rear wheel arches have been pumped up and out like a muscle car but the look is tasteful as you’d expect from the German car maker. The sloping roofline of the coupe hampers headroom for the rear passengers and makes getting into the coupe a hassle but when you’re inside there’s plenty of legroom. The interior is well made and tasteful but there’s nothing new. The seats are lower and firmer than they are in the saloon but the rest of the cabin is identical to any other 3-Series. The additional cost of the coupe is reflected in the car’s equipment level as leather is standard throughout the range and there’s a DAB radio, 17-inch alloys and Bluetooth connectivity. There are currently three engines on offer: a 2.0 litre four-cylinder with 245bhp, a 3.0 litre six-cylinder with 306bhp and a 2.0 litre diesel with 184bhp. Unfortunately only the 420d uses BMW’s long lost naming structure of series number followed by engine capacity as the 2.0 petrol is called a 428i and the 3.0 litre is named 435i. Although the rear seats are small and there’s a £3,000 premium over the equivalent 3-Series, BMW will sell plenty of the first incarnation of the 4-Series even though rivals like the Audi A5 Coupe and Mercedes-Benz C-class Coupe are slightly less expensive.